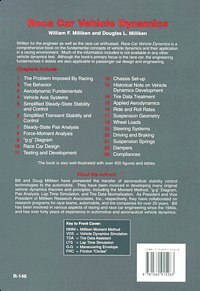 Milliken Research Associates, Inc. -- "Race Car Vehicle Dynamics"
Published in 1995 and now in its thirteenth printing, Race Car Vehicle Dynamics (RCVD) is the first in a series of books written by Bill and Doug Milliken on the topic of vehicle dynamics. Written for both the engineer and the automobile enthusiast, RCVD explores the engineering details governing the motions of automobiles in general and race cars in particular. Topics addressed include: Tire behavior, Aerodynamics, Steady-State and Transient Stability & Control, Wheel Load analysis, Steering Systems, Suspensions, Dampers, Force-Moment analysis, "g-g" Diagram analysis and much more. The historical chapter on vehicle dynamics development is a good read in itself for the non-mathematically oriented. In February 2002 Milliken's 700-page complement to RCVD, Chassis Design: Principles and Analysis, was published. 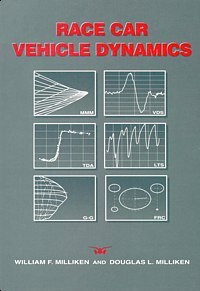 While RCVD looks at the fundamentals and the big picture of vehicle dynamics, this book focuses on the details of suspension and steering systems, springing, oscillations of the unsprung masses, sprung mass roll effects and other design details. Implications on vehicle ride and handling characteristics are emphasized. To learn more about this complementary text click here. To read the text of the back cover, click here. To see the Errata List, click here. RCVD has sold over 30000 copies and is being used as a textbook at over twenty universities. The Millikens have worked closely with faculty to develop curricula. The companion book Race Car Vehicle Dynamics: Problems, Answers and Experiments provides problems, worked solutions, vehicle dynamics programs on CD and other additional material to assist in learning and understanding vehicle dynamics. We invite readers to send their comments and suggested corrections to us at info@millikenresearch.com. Visit the SAE Bookstore for purchasing information.